Corpse Harvester fetched a Thraximundar, but it was too late. I huge horde of Angels did me for 46 (Luminarch Ascension for Kynaios). This was a reconstruction, reconfiguring of my original 4-color tagteam zombie deck. Reyhan isn’t a zombie, but I rebuilt it around a Zombies and +1/+1 counter theme with stuff like Skullbriar and Grave Betrayal, etc. I started out with lands and an Angelic Renewal, Molimo had a Burnished Hart and Tasigur played a Rakshasa Death Dealer. I played Mikaeus on turn 3, and an Emeria Angel on turn 5 with 2 land fall triggers. Molimo continued to ramp and played a Doubling Cube which Tasigur killed with Vraska the Unseen. I played a Caged Sun on turn 6 and swung to kill Vraska and knock a Kiora down to 6. On turn 7 Molimo attacked as a 10/10 with deathtouch via Nylea’s Bow. I played an Aegis Angel (protecting my Caged Sun) and a Custodi SoulBinders as an 11/11. The following turn I played Sandstone Oracle, and then played the keystone card of the deck, Gleam of Authority, on Mikaeus. At this point there were at least 20 other counters in play, and mikaeus could tap to net 4-5 more counters each turn. I swung at Molimo with a Charioted up Mikaeus getting through for 20. Molimo responded with a World Spine Wurm. Tasigur Sorin-ed me down to 10 and used to Kiora to make Mikeaus do no damage. I was still able to swing with a sizeable crew of birds and angels though, and was able to hang on to win. About the Deck. I was feeling like building a plains-heavy mono white deck to make use of Kor Cartographer and the new Angel that reanimates creatures on plains-fall. Mikeaus seemed like a good general for a white ramp deck. I like to call Chariot of Victory the Pope-mobile. Gleam of Authority is a great card in this deck. There are a few extra sac-engines to help fuel the Kor Cartographer shenanigans. Ihsan (piloted by Gisa’s player) started out with a Stinkweed Imp and a Vault Skirge, and later an Abyssal Gatekeeper. I stared with a Cloudfin Raptor and an Ironshell Beetle for some +1/+fun. But despite a Grazking Kelpie and a Thrumming Bird, Ihsan was able to equip a Cranial Plating and a Whispersilk Cloak and kill me in 3 shots. Then Axelrod Gunnarson showed up. I lost this one too (Axlerod did some tricks to kill me), but the highlight was having 33 lands in play due to Gilderbairn and Fertilid tricks. Also there was a Lesser Werewolf, which counts for something. About the Deck: This deck was born of discussions we had in previous weeks about potential other non-legendary Pauper Commanders. As Gilder Bairn was 1)in the best colors, 2) involved doubling things, and 3)had the most creepily adorable art ever, it became clear that I had to build this deck. It’s mostly (obviously) centered around things with +1/+1 counters to be doubled. Especially Graft and Evolve creatures. I had perfect starting lands, and led off with a Llanowar Reborn. Next turn was Warden of the First Tree (with a counter) and an Orzhov Basilica (refreshing the Reborn), which Leveled-up the Warden. Then I played a forest and Anafenza (with a reborn counter). Karador played a bunch of mana dorks, and Gisa had a ton of Artifact Mana and a Necropotence. Then I proceeded to get out the Holy Trinity (Tuskgaurd Captain, Ainok Bond-Kin, Mer-Ek Nightblade) to make my guys super-ultra deadly, and started to Outlast what I could. A mix of Warrior and Spirit Token tribal with a bit of a +1/+1 counter theme. (that plays differently from other counters/tokens decks I have). Anafenza is just a good cheap beater, and graveyard shenanigan nerfing is gravy. I considered trying to make it a Tarkir-only deck, but there were just enough other cool things I wanted to add to make it not worth it. I think this deck actually started as a fork off of a Teneb deck that I haven’t quite finished yet. There were 6 people tonight, so we split into two tables of 3. A new player showed up, but he sat at the other table (but got mad props from me for having Vodalian Mage in his Kruphix deck). Exava had just been completed, so I decided to give it a whirl. I had a 4 land hand, and played them until I could cast a Mer-ek Nightblade, which I Outlasted and then played Exava. I couldn’t hit my 6th land. I also played a Bitter Feud on the other two players. Grimgrin was mana-screwed for awhile, and Karona was really ramping, as well as having a Lurking Predators that gave him a Scourge of Valkas. Grimgrin caught up with mana and cast his General with a pair of boots. Karona played an Ojutai. I attacked with unleashed Exava, unleashed Carnival Hellsteed (Exava’s Little Pony) and the Nightblade which killed Dragonmaster Outcast and the Scourge of Valkas (Karona had smashed me pretty hard), and then Grimgrin used Vengeful Dead and Fleshbag Marauder to wipe my board (and also attack me DESPITE the existence of Bitter feud). Grimgrin did some smart countering and Killed Karona with General Damage, and then killed me. It was a mostly fun game. Exava just looks cool. I Love Mer-Ek Nightblade. Beyond that, it’s a deck with some +1/+1 counters stuff, some “what is blocking?” stuff, and a small “Bad Girls” theme. It’s other trick is Plague Sliver/Bazaar Trader/Hivestone, because that amuses me (I think that’s how the deck actually started… it was going to be Tsabo Tavoc). Lazav was being Grimgrin again, and a different Karona deck was being played (this one was super dragony post Fate Reforged. I was playing a deck that might not have had a win condition. I started with a 3 land hand and a Quest for the Nihil Stone and Serra’s Hymn. Gisa came early with a Gauntlet of Power, but I think it got destroyed. Grimgrin’s pet Crypt Rats came out and did their thing. Then Gisa had Necropotence and a Caged sun. I spent a lot of time playing with counters. I had Power Conduit and a Astral Cornucopia for 3. The big play came when Horde of Notions Reforged the Soul pumping my Quest up to 22 counters (and thus fueling the Power Conduit for a long time). I also built up a Time Bomb to 4. And was using tricks to use Magistrate’s Scepter every other turn (I have since added Clock of Omens, which is a flavor fit AND would let me have a janky infinite turns machine). I was also playing lots of Will of the Council with Coercive Portal and Brago’s Representative. Gisa was doing things with a Lashwrithe and 1000 year elixir and a caged sun and building up guys, Karona had stuck some pretty dangerous dragons like Utvara Hellkite, possibly thanks to a Dragonstorm for 2. I had moved on to playing with Eye of Doom (everyone picked on Gisa) and was building a Darksteel Reactor up (I think I got up to about 12, and had the board not mostly wiped, could have maybe won with it on the next turn(s) via tricks and magewright stone, 100 year elixir and Coretapper (who got killed)). But I had to get on offensive defense and start using Triad to exile creatures and also use Parallax Wave. I had to blow up the world with Oblivion Stone (saving a few of my things), and I totally cast Frankenstein too, but ultimately couldn’t hold on. However, I got to do lots of things with random counters, have several Votes (which unfortunately always went my way) AND cast Frankenstein. so it was fun. The plan for this deck was “All of the Counters except +1/+1 or Charge.” But, as I was building it, I realized that it couldn’t be done in any sort of playable way with out at least Charge Counters. We’ve got Page, Quest, Time, Fate, Verse, Doom, and more. Technically Frankenstein can have +1/+1 and so can Spike Cannibal, but the former will always get +2/+0 counters on my watch, and the latter is there to punish those who play with the dreaded +1/+1. I wish Giant Fan were black bordered. A 5 player game didn’t seem to be the best place for Vhati to shine, but the deck was meant to be a fun one, so I decided to play it. I had a 3 swamp hand plus Boots and Illusionists Bracers, and more equipment. I was able to play a Mortar Pod, and maybe an elf that got me some land. Balthor had an early Urborg and Liliana of Everyone Discard, Sisters (a super-ramp deck) brought out Ob Nixilis and Oloro was doing things with Maze of Ith, Crypt Ghast and tutoring with a Demon. I spent most of the game with few to no cards in hand. The deck needs more card draw (or I didn’t draw any card draw). Eventually I got Vhati out AND put illusionists Bracers on him. I got to do some tricks that killed a few things -1/-1 counters. Bruna got out a Sovereigns of Lost Alara, which I had to kill because it’s trouble. Bruna also finally smashed up Liliana. 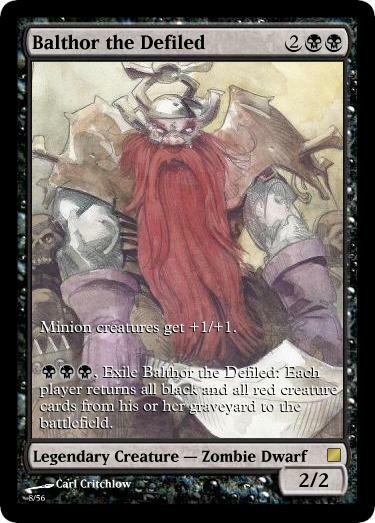 Eventually Balthor got ridiculous and wiped the board a few times, generated ridiculous mana with Caged Sun and Candelabra of Tawnos, and tricks with Geth and Gray Merchant and Toxic Deluge. It wasn’t pretty. I got to do things in the game with my General, so I consider it to be a mostly fun game. I would have liked to have a few more cards to be competitive. Vhati il-Dal is Da’ Illest. I have more than a few +1/+1 counters decks, so I decided to make a -1/-1 deck. Vhati has been on my radar for a LONG time as a potential general. I do play with Quillspike Devoted Druid in this one, and also Thornbite Staff. The goal of course, is to put counters on things and then shrink them, including my own creatures sometimes. I didn’t take good notes of the rest of the night (which was almost a month prior to this writing), but I do know that I probably followed up with Skullbriar (for Golgari +1s). I think I also rolled out Animar and had fun with that.